This is a post about a book, just one book, any book, that you would like to read. 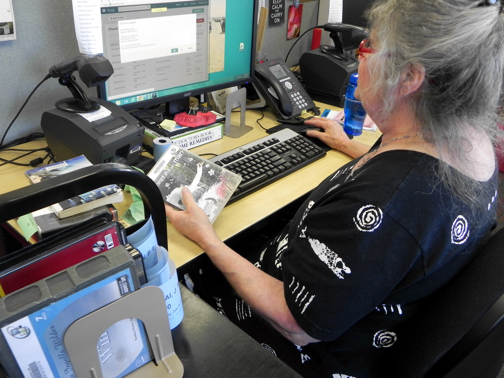 It's about what goes on behind the scenes at Sno-Isle Libraries to get that book to you. Maybe you've heard of a certain book from a friend or read a review of it online. Perhaps you were enchanted with the book's cover when you saw it at the store, or you want to research a particular topic and came across a title that promises to be exactly what you are looking for. It's this specific book that you have in your mind, and you'd like to check it out. 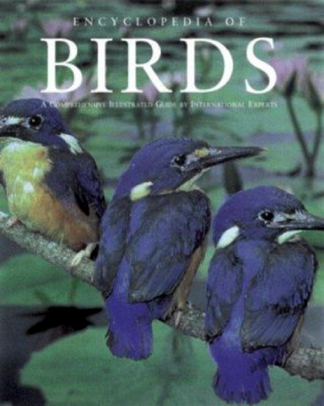 Let's just say the book you are looking for is Encyclopedia of Birds. So you go to the Sno-Isle website and type the title in the search bar, and up pops your book. Just like that, you see the entry, read the description and any reviews that are posted, and smile as you say to yourself, Yes! It's just what I'm looking for! Your part is relatively simple. All you have to do now is wait for notification that the book is ready for you to pick up. If the book happens to be on the shelf in your local library, your wait won't be long. One of the staff will pull it off the shelf and, after a bit of record-keeping, put it on the hold shelf for you. Often, however, the title you have selected will come to you from another library in the system. How does your book get from one branch to another? 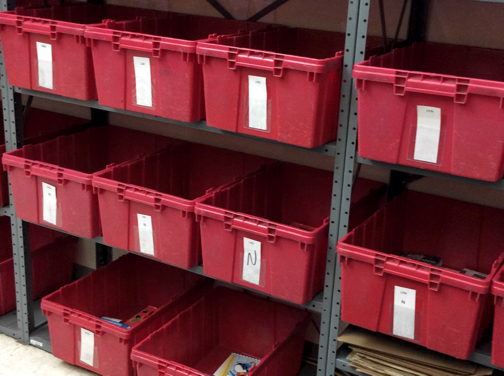 Each of Sno-Isle's libraries has a bank of red bins set up in a work area for books that are needed at one of the other branches. 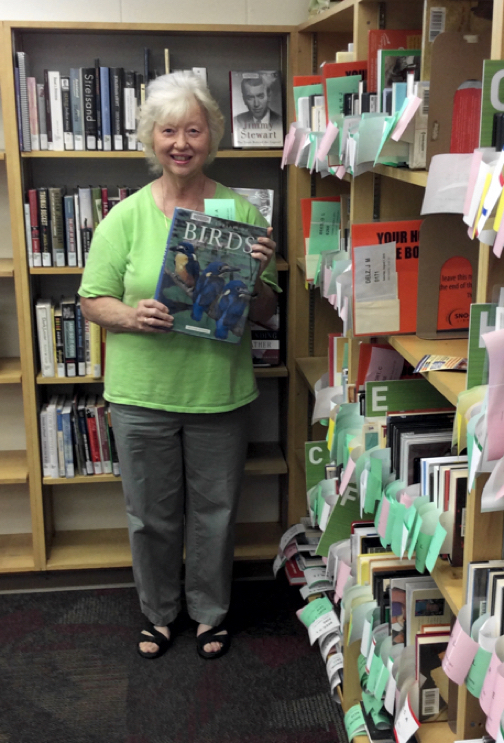 Notified digitally by the Service Center, the staff or volunteers pull the titles from the shelves that are wanted elsewhere and place them in the bins. The final destination of the books in the bins is clearly marked. 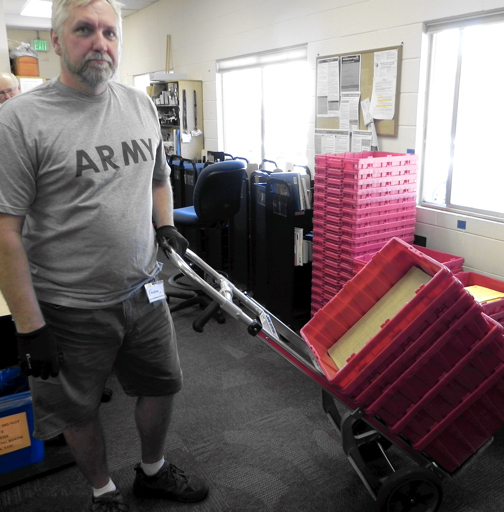 These bins are picked up daily and delivered to the work room of the Service Center, where the walls are lined with rows and rows of red bins. 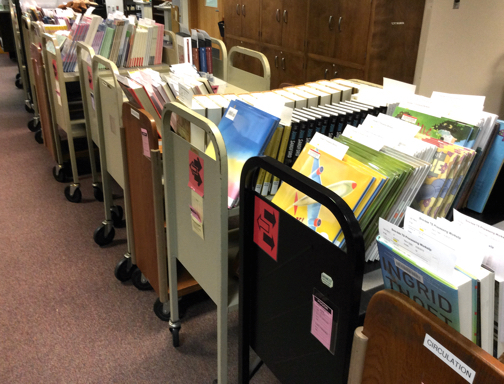 Books that are going from one branch to another pass through the Service Center work room. 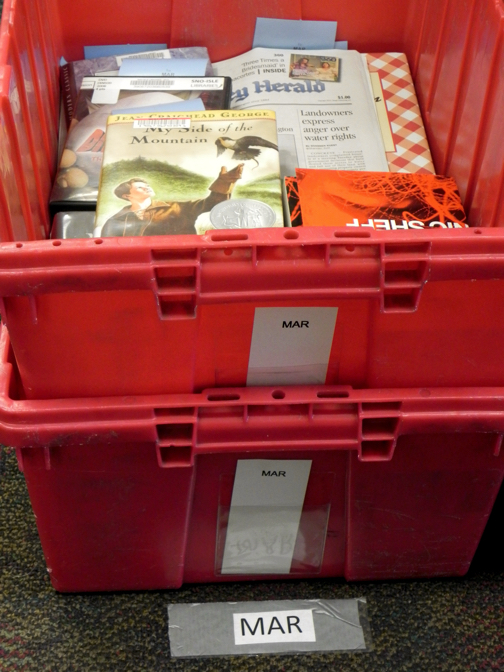 Staff sort through all the incoming books and place them in the appropriate outgoing bins. 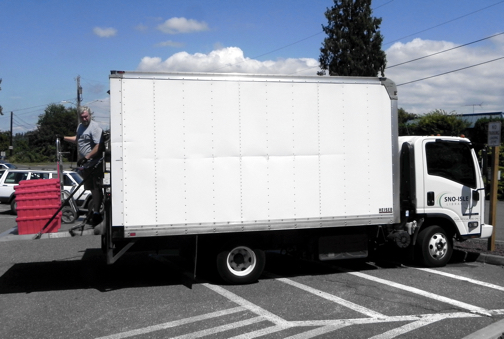 Each morning between 9:00 and 10:00 four trucks leave the Service Center on their routes, transporting the books to the libraries across Snohomish and Island counties where they will be processed and put on the hold shelves. 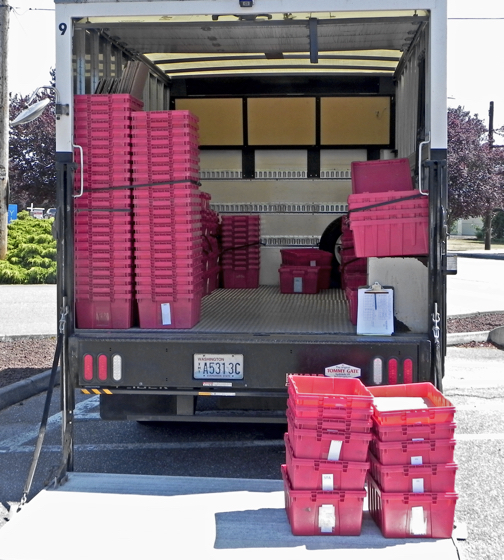 There's plenty of room in this truck for lots of red bins! 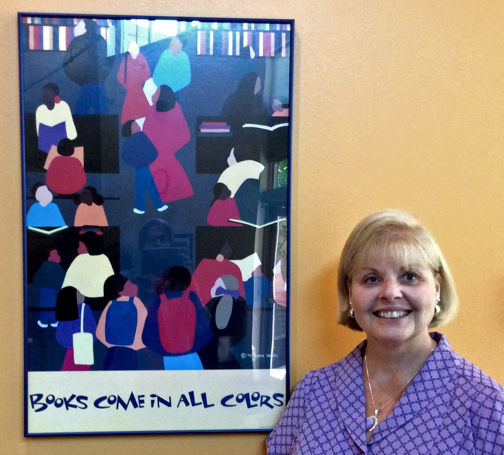 Did you know that Sno-Isle libraries has one-and-a-half million items in its collection! Besides all the books, you can find everything from electronic media, movies and music to newsletters, blogs and material in various world languages.To learn more, go to the website home page and click on the button that says eBooks and More. 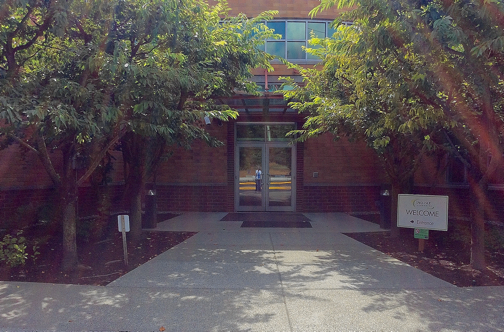 Next week we'll showcase the new Camano Island Library, which opens on August 1. If you'd like to see a teaser video, click here. Part 1: They Don't Have the Book I Want! Have you ever checked the public library for a book or resource you'd love to get your hands on and discovered that it is not available? What do you do? Well, you could hunt around for something similar, or settle for a different book by the same author. You might just give up and go to a bookstore or an online bookseller and purchase what you're looking for. But did you know that you can request the library to order the book for its collection? Today is the first of a six-week blog series in which I introduce you to some of the amazing features of the Sno-Isle Library system. It is likely that, if you live out of the area, your local library offers some of the same services that make Sno-Isle such a great resource in our community. But first, I want to tell you about the Sno-Isle Service Center. If you are driving south on Interstate-5 through Marysville, WA, you may have noticed the large brick building just yards from the freeway off to your right. It houses the approximately one hundred administrative and support staff that keep the twenty-one community libraries, the online services, and the Library on Wheels of the Sno-Isle Library running smoothly, freeing up the librarians throughout the region to meet the needs of patrons who rely on their local libraries. Recently I toured the Service Center, being introduced to the workings of many of the departments by my gracious and knowledgeable guide, Nancy Pursel, Sno-Isle's Volunteer Program Administrator. I was already a fan of the library, but this was like going to a familiar hiking area and discovering new trails that I didn't know existed. So, back to the dilemma at hand, checking the catalog for an item from the library only to learn that there is no such title listed. Unless your need for the book is urgent (we'll just say book, although it could be any number of other things that you're looking for), you can click on the link on the Sno-Isle website that says "Ask Us, Tell Us." Halfway down the page you'll find "Request an item not in the catalog." Click on that and follow the instructions. So here's the cool thing about this. There is a Collection Department at the Service Center, made up of trained librarians with specialties in various genres, who see your request and go to work trying to meet it. They research the book, looking up reviews and seeing if there are already similar books in the collections, then determine whether or not to approve the purchase of the title you have requested. Perhaps they approve the purchase. They pass the request on to the Acquisitions Department, where the staff spend their days buying books. Sounds like a great job to me! 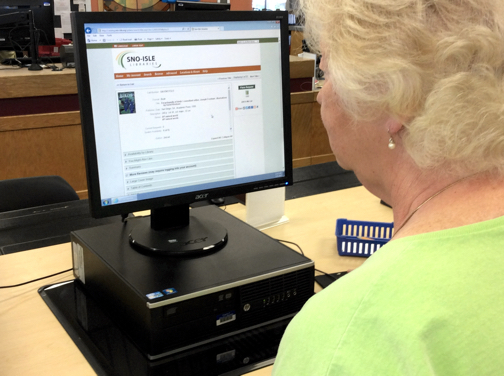 The Catalog Department creates a temporary description and adds it to the Sno-Isle catalog, so that people who use the system have a chance to put the book on hold. For every five holds, they buy one more copy of the title. I've been on very long hold lists as I've waited for my turn to get the book, but even when I am number 325, there are enough books being purchased that my copy shows up within a reasonable amount of time. Every day books and other items are being added to the Sno-Isle collections, not just three or four books, but usually a hundred or more. Daily! You can browse the recent additions here. If you request a book and the request is denied, they may be able to get you a copy from another library outside the Sno-Isle system. That is called an Interlibrary Loan. Or they may discover that the title is actually available through Sno-Isle, just a bit difficult to track down. Of course they may be unable to fill your request, but they will have done their best to help you get what you're looking for. Come back next Friday morning at three minutes to nine to read Part 2 of What You Didn't Know About Sno-Isle Libraries So You Didn't Think to Ask! If you live in the Pacific Northwest you have probably heard the dire predictions for an earthquake that will destroy a sizable portion of our coastal area. According to Kathryn Schulz in "The Really Big One," an article in the July 20, 2015, issue of the New Yorker, we are already 315 years into a 243-year cycle since the last mega-earthquake that hit the Northwest in 1700. 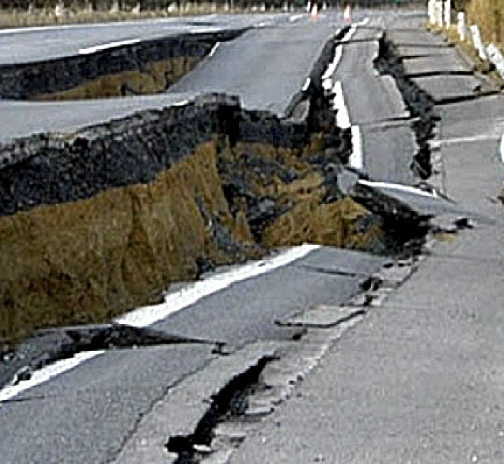 That same earthquake caused a six-hundred-mile-long wave to strike Japan's eastern coast. It leveled homes, breached a castle mote, and caused an accident at sea. Experts say that there is a one-in-three chance that a 9.0 earthquake, accompanied by a tsunami, will occur in the Pacific Northwest some time in the next fifty years. If it does, we are told that everything west of Interstate-5 "will be toast." The article warns that we are ill-prepared for this horrific event and, even more troubling, those of us living in this area have shown little concern about the possibility. Besides that, few early warning systems exist and, even if they did, most of the seven million people living in the affected region would have little time to evacuate. The author points out that surviving this disaster seems unlikely, yet the prospect of living through the aftermath of the catastrophe is unthinkable—one to three months without electricity and drinking water, along with sewer service out for a month to a year, highways requiring six months to a year to restore and health-care facilities needing eighteen months to restore. Reading the article left me feeling helpless, like I've been thrown into a sea of information, unable to swim, and equipped with only a child-sized lifejacket. It reminded me of years ago when I sat alone in my apartment on a Sunday night, watching The Day After, a disturbing movie about a nuclear holocaust and its effects on a small town in Kansas. Riveted, I could hardly bear to watch, yet I couldn't look away. I may actually have breathed while watching the movie, but only during the commercials. The film is devoid of hope. At the end the earth is all but destroyed and hardly anyone is left alive. I sat transfixed, staring at the screen as the credits rolled. From my stupor I began to hear the soundtrack, a bold hymn infused with hope, which grew louder as the song went on. It was "How Firm a Foundation." I sang the hymn all evening and again the next day as I drove to an appointment, modulating a step up in pitch with each new verse. My car was a sanctuary, my song an offering. Gloom gave way to gladness as I let the words of the hymn fill my heart and mind. Truth pervades each phrase of the nearly 230-year-old song, truth taken directly from Scripture, truth that sets us free (see John 8:32). The more I sang, the freer I became—free from hopelessness and dread, free from fear of an uncertain future. I'll never, no never, no, never forsake!" Embracing this hymn does not guard against the possibility of a nuclear holocaust any more than it guarantees the Northwest corner of the US won't experience a devastating earthquake and tsunami. We must act wisely, doing all we can to prepare ourselves for the uncertain future. But all our physical preparedness will do us little good if we do not have a firm foundation. That foundation, laid out in the Bible, points us to God, who has promised never to forsake us. His all-sufficient grace is our supply. Our hope is in Him, and we need not fear. *Written by John Rippon, 1787; Public Domain. The words, as found in The Hymnal for Worship & Celebration, are based on Isaiah 43:1-2.